People choose to learn Spanish in the Dominican Republic - a Spanish speaking island in the Caribbean - for various reasons. 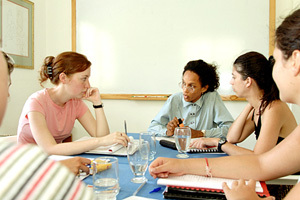 The Spanish courses at our school in Santo Domingo run throughout the year. Our students come from all over the world, choosing the Dominican Republic for different reasons, but all looking for high quality Spanish courses, where they can learn as much Spanish as possible but also enjoy the lifestyle and incredible natural beauty of the location. The Dominican Republic's breathtaking natural beauty, combined with the incredible friendliness and hospitality of the locals, makes this a perfect destination for an unforgettable travel-study experience. Though Santo Domingo is a modern city, it also has a fascinating and well-restored historic centre, where our school is located, in a typical Colonial-style building. The school has its own cafeteria and all rooms are equipped with air-conditioning and/or a fan. The school also organises Latin Dance classes, which are very popular wtith students. With the beauty of its landscapes and friendliness of the locals, most people fall in love with the Dominican Republic, but be prepared for occasional power cuts - it's all part of the experience! Fly to Santo Domingo. Airport collection available.